Allow merchants to provide the customer with a complete gifting experience on their e-commerce site. Select gift wrap suitable for any occasion and type products before delivery. You can add unlimited Wrap Designs and classify them also in gift wrap types. This option displays on the Checkout Page as well. This extension allows you to add a wide collection of gift wraps to your online store. Let your customer Wrap their attractive designs. Let your customers effort more easy to assign Products to the gift wrap designs so that you can save their valuable time in searching for wrapping facility separately. Get your charges for the gift wrapping service you offer. Create Various Types of Gift Wraps You can create different wrap types to facilitate users in selecting a wrap suitable for different occasions e.g. Weddings, Birthdays, Anniversaries etc. 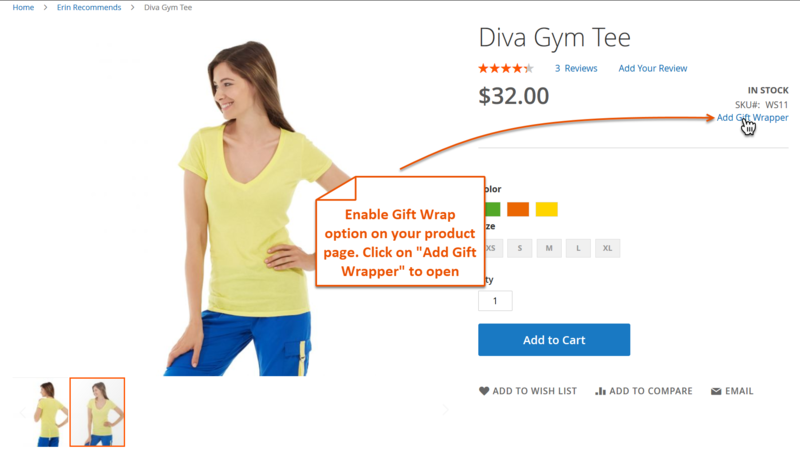 Restrict Gift Wraps to Store Views You can enable the gift wrapping facility to certain store views. Personalize Gift Wrap Option You can write a custom label for the Gift Wrap option to display. This will help users to easily understand the field. Displays Gift Wraps on Cart & Checkout Page Display Gift Wrap option on the Cart and Checkout Page to let the customer know they have selected a wrapper as well.